Everyone on the Warriors knows Kevin Durant will play for a greater purpose Thursday night. That’s because Clifford Dixon, whom Durant calls his “adopted brother,” was shot and killed outside of Atlanta, police said Thursday. He was reportedly celebrating his 32nd birthday on March 17. Durant was in Oklahoma City Wednesday night to celebrate longtime Thunder teammate Nick Collison’s jersey retirement ceremony. He returned to the Bay Area Thursday ahead of the team’s game against the visiting Indiana Pacers. He intends to play. 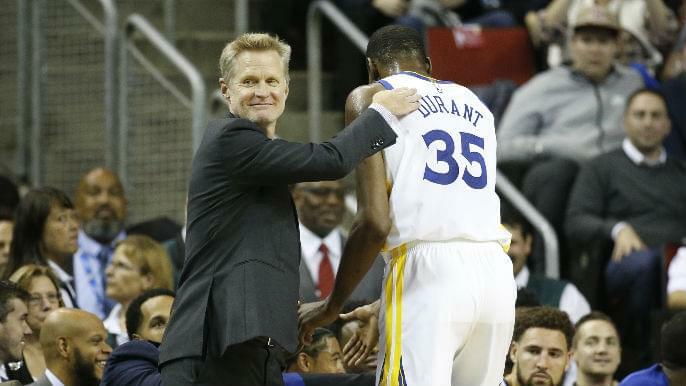 Steve Kerr spoke with Durant at a “somber” morning shootaround. “I did speak with Kevin, obviously a very difficult time for Kevin and Kevin’s family,” Kerr said. “Obviously, the family involved, and Quinn Cook was very close with the victim as well. (There was a) very somber mood in shootaround today. I know Kevin is going to play tonight. He didn’t say anything about not playing.